Gallery-Wrapped Canvas entitled Stomping Ground by Joshua Schicker 30''x24'' by greatBIGcanvas at When Art Imitates Life. MPN: 2453407_1_30x24_none. Hurry! Limited time offer. Offer valid only while supplies last. Gallery-Wrapped Canvas entitled 'Stomping Ground'. 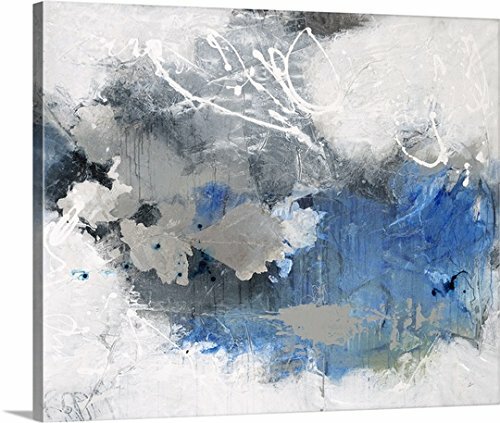 Contemporary abstract painting in white and blue, with white swirls. Multiple sizes available. Gallery-Wrapped Canvas entitled 'Stomping Ground'. Contemporary abstract painting in white and blue, with white swirls. Multiple sizes available. Primary colors within this image include: White, Gray Blue, Dark Navy Blue. Made in the USA. Satisfaction guaranteed. Archival-quality UV-resistant inks. Canvases are stretched across a 1.5 inch thick wooden frame with easy-to-mount hanging hardware. Canvas frames are built with farmed or reclaimed domestic (pine or poplar) wood.